Every year, high school students plan and prep for their upcoming prom. Finding the right dress, saying yes to the right date, and attending the best after-party. It's supposed to be the perfect night – but that could all end in an instant. If you're going to drink on prom night, do not drink and drive. There are a number of startling facts about prom night. Over the years, our law firm has seen the devastation and tragedy that comes with drinking and driving, especially when it affects teenage lives. More than 90% of teens believe their fellow classmates will likely drink and drive on prom night. Only 29% believe that driving on prom night comes with a high degree of danger. 36% of teens said their parents have allowed them to attend parties where alcohol was present and available. 14% of teens say their parents have hosted teen gatherings with alcohol, violating Pennsylvania's Social Host law. 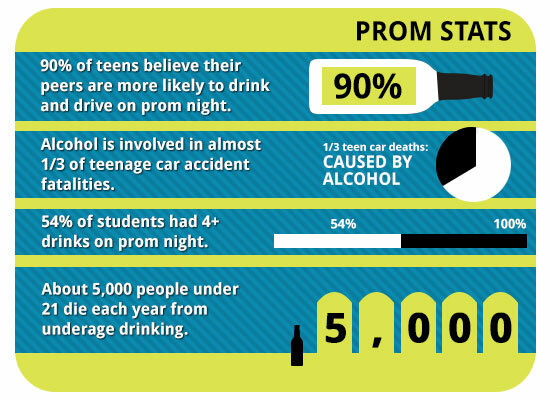 54% of students drink more than 4 drinks on prom night. It's the simple truth that some teenagers will engage in underage drinking on prom night. It's a dangerous gamble, and one we hope you or your teenager will never make. Know where they'll be throughout the evening and find out their transportation plans. Don't give permission to attend parties that will be serving alcohol to minors. Get details about prom from your child's school. Discuss the dangers of drinking and driving with your teen. Encourage your teen to call you if they ever find themselves in a situation where they're with an intoxicated driver or are too drunk to drive. It's better for them to be safe than to remain in a dangerous situation. Create a prom night contract with your teen, stating that he or she won't drink and drive or ride with anyone who's been drinking. Encourage your teen to sign our Safe and Sober Pledge. Never provide alcohol to teens at a party. You could face serious fines and even jail time under the Social Host Laws of PA.
Never drink and drive or ride with someone who has been drinking. Arrange for safe transportation before prom night arrives. Plan to attend after-prom parties that don't include alcohol. Don't leave your drinks unattended. Stay with your group of friends and look out for each other. If a friend has been drinking, make sure they don't drive. Listen to your parents or guardians about the dangers of underage drinking and driving. They care about your safety. Sign the Safe & Sober Pledge to commit to safety on prom night. Peer pressure may tempt you to drink on prom night, but we hope you say "no." Underage drinking and driving causes serious accidents and even death. That's why we hope you'll avoid the alcohol to enjoy your night – and your future. If a drunk driver injured you or a loved one, contact our law firm for a free case review. It's always free to speak with our legal representatives, and there's never an obligation to hire our law firm. We'll get you the answers – and legal help – you need.